A Cornish MP and his fiancee are celebrating the birth of a baby boy. Arthur Simon Rowan Taylor, son of Truro and St Austell MP Matthew Taylor and Vicky Garner, was born on Friday weighing 7.5lbs (3.4kg). 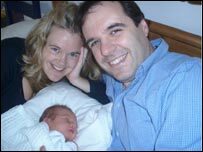 The couple had planned a home birth, but Arthur had ideas of his own and was born at St Thomas' hospital, across the river from the House of Commons. Mother and son are well despite an emergency hospital admission and the family hopes to return home soon. Vicky Garner, a former director of pressure group Surfers Against Sewage, said it was a bit of a shock to find herself in hospital, but that her son was already a "gorgeous contented little boy". She said: "He takes after his dad already - not surprising since the view out of the hospital window was the House of Commons. "Not quite the home birth we planned, but all is well and I could not be happier." The parents thanked the midwives and hospital team after the natural birth. Mr Taylor said: "Arthur is just as beautiful and perfect as we hoped. "We are taking some time together now with the baby, and our parents have come up from Cornwall to meet Arthur and lend a hand. "What we really want is to get him home to Cornwall soon, once both of us have had some more sleep and the midwives are happy for Vicky and Arthur to make the trip."